A little bit of tropical paradise, high above the coast. Tranquil and isolated you can relax in comfort and peace. Yet, just down the mountain are all the beaches of Luquillo, and just up the mountain is the El Yunque rainforest. Ideal location for your vacation. 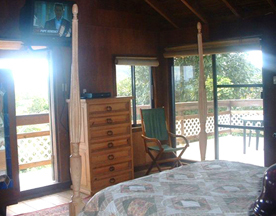 Wrap around porch, on the left photo, is off the master bedroom in the 3 bedroom chalet. Sue also rents out a separate, smaller unit called 'The Loft' both have T.V. & Wifi. My husband and I have stayed at Sue’s Place four times and I am chagrined to admit that I am only now taking the time to write about it. If you don’t require the sterile environment of a standard Holiday Inn room but are a little more adventurous, you will undoubtedly find Sue’s Place delightful. 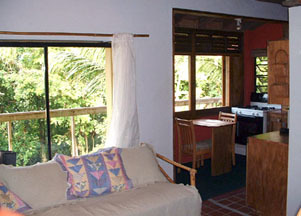 Nestled in the rainforest, surrounded by lush tropical trees and flowers, it is located minutes away from El Yunque Caribbean National Rainforest, as well as the town of Luquillo with its beautiful beach and a wide array of kiosks where you can choose to explore typical Puerto Rican fare one night and Spanish tapas or Peruvian food another. Sue is a generous and charming host who did everything in her power to ensure that we got the most out of our stay on the island. 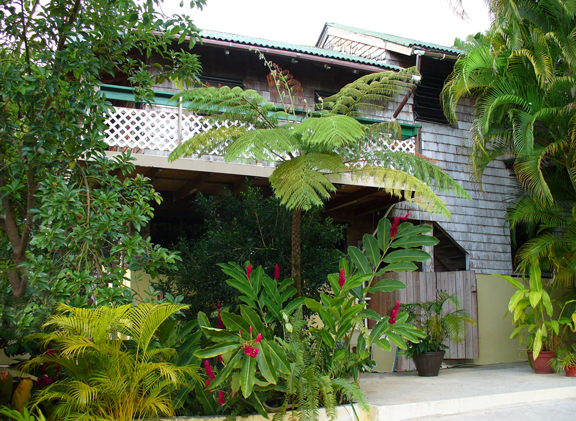 We stayed at the loft: a quaint and very comfortable studio apartment with a porch where warm Caribbean breezes caressed our skin and the coquis serenaded us, as we swung carefree on a hammock. The last time we were there we noticed that they had replaced the bed, the refrigerator and the stove, and were impressed with their conscientious efforts to maintain the property. We highly recommend Sue’s Place for a uniquely charming and romantic experience. September 2007. We loved the area. The El Yunque rainforest is beautiful with great hikes and pools for swimming. The people are friendly and very accomodating. The town of Luquillo is a sleepy little town with a nice public beach great for surfing. We had great pastries in the bakery across from the town square. Amy and I want to thank you again for an extraordinary, up close stay and experience in the Rain Forest. We appreciated all of your kindnesses and hospitality. It was a rare opportunity to "live" with the birds, the trees, flowers, tropical showers, and the wonderful coqui. What a peaceful place to be for us. All in all, it was a great, relaxing time for us. 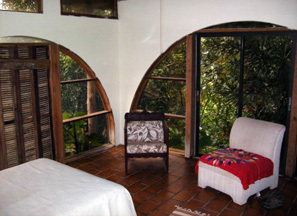 We can't imagine NOT having experienced the rain forest with at your place. Ponce was a real gem. I can understand how it must have been before the Sp/Amer. War. The architecture is glorious and much is on its way back through restoration. Had an exceptional dinner at Mark's at the Melia Hotel. Thank you again for all you did to make us welcome. Sue's Place is a terrific getaway. 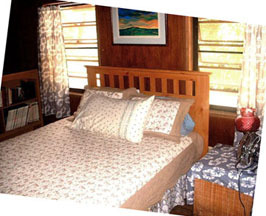 We first rented the chalet six years ago, for a week , and had the most wonderful vacation ever! We started our mornings with Sue making us a smoothie. When we weren't at the beach then we went hiking in the rainforest or cooling off in the chilling waters of the river. The best part of the trip were the romantic evenings we spent on the balcony with the million dollar views overlooking both the ocean and the mountains. The views are incredible. Definitely a trip worth remembering, In fact our third daughter was made there! We go back every year and our kids love it too!!!! your vacation in Puerto Rico. We stayed in the very comfortable studio apartment for four nights. Sue met us the night we arrived, showed us the place, and made us feel very welcome. Loved the place! Thanks again. We will be posting pictures of our research on the forests on our website and will be sure to send you the link. We will certainly be back again in the near future..
"Sue's villa is an amazing place to be in. We rented the chalet for a week. Sue escorted us to the villa the night we arrived. We had a very peaceful stay at the villa. We loved the coqui frogs and the tropical showers. The view from the chalet is beyond words. The beautiful breezy mornings gave our days a great start. 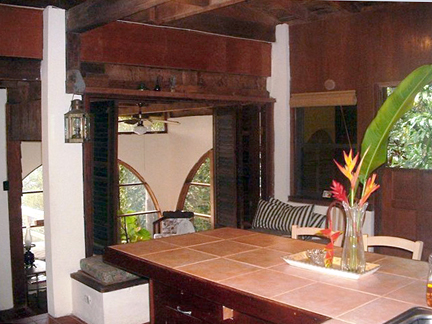 The rainforest and Luquillo beach are just minutes away. Luquillo is a nice little town with good kioskos. We drove down to the beach several nights just to enjoy it at night. We found the area pretty safe. Sue is very friendly and very approachable. All in all we had a great vacation. Thanks Sue!" • MT. Britton Tower is a favorite hiking trail with the tower destination and views over the mountains tops. 45 minutes up from the parking at the top of road #191. Sunny days you can see forever, cloudy days the clouds swirl around and below you! The El Portal Visitors Center ( now closed) lies just below the rainforest and offers an introduction to the rainforest with exhibits, a film, store and snack bar. Entrance Fee. Weekends local artisans set up.